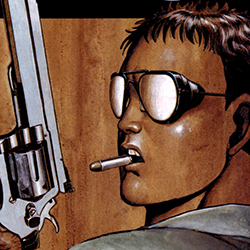 Synopsis: This is a no-holds-barred story about an ex-biker gang leader turned cop, Kenji Date. Operating under the nickname Hyena, Date rubs pretty much everybody within the police force the wrong way as he goes about his business ridding the city of all its scum. Bad Police also contains two separate short stories at the end of the volume: Bomber: The Chinese leader, Deng Xiaoping, had promised to rid Hong Kong of its criminal organizations. One of the places they migrated to was Japan. Kamon Shou is a delinquent who just got released from Youth Detention after spending two years there and is about to feel first-hand the effect the Hong Kong mob has on Japan. Artemis: Ginko is a detective working for the famed Holmes Detective Agency, an agency that takes on the most dangerous of jobs: ones that even the police wouldn't even think about doing. She gets hired by Ms. Nancy to retrieve her seven year-old son, Tom. Tom was taken away by her father-in-law's mafia organization in hopes of cultivating Tom to become the next leader.